FINDING employment can be a difficult process. A competitive job market, having the right skills, and being able to present those skills in a format acceptable to prospective employers are all factors which can add to the stress and difficulty, even for those who feel they are qualified. 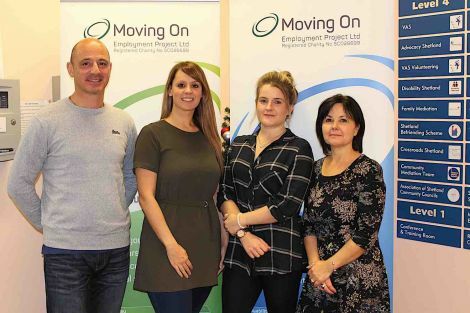 Barriers to employment such as a conviction, mental health condition or having no work experience can make the whole process even harder, but thankfully the Moving On Employment Project (MOEP) can help. Set up in 1997, the charity initially worked out of the Eric Gray Centre as a service to support people with disabilities to find employment opportunities. Over the years it has evolved, and currently provides two main services aimed at supporting people into employment from Market House in Lerwick. The transition service, funded by the Big Lottery fund, works with young people aged 16-25 who may have additional support needs or autistic spectrum conditions to increase their opportunities to enter employment; while the job brokerage service, which is offered as part of the council’s employability pathway through the European Social Fund (as part of the wider European Structural Fund) supports people with barriers such as convictions to find work placements and paid employment. The MOEP is run by coordinator Lincoln Carroll and a team of six support workers, who work to link clients to opportunities that will improve their employability by, for example, gaining work experience, undertaking training, increasing confidence and developing other skills. The criteria for being accepted into the job brokerage scheme via the pathway is having two barriers to work as well as being unemployed. These barriers can be varied, but include criminal convictions, substance misuse issues and mental health problems. The factors that can prevent people finding and staying in work are varied. Seemingly small issues, such as not being computer literate, struggling to fill in applications or having to rely on public transport can all have a big impact on someone who is lacking confidence or has other, more serious problems. MOEP also helps people with these issues, assisting with online applications and other practical tasks. Key to the project’s success is the relationships clients build with their support workers, who help clients create personal development plans and set and achieve goals. Mr Carroll said: “The skill mix of the team is really important, and matching a participant with a support worker to see who’d best work together is crucial. It really has to be able to work, a lot of time is spent building up the relationship.” Once an employment opportunity has been secured by a participant, MOEP will then support them for up to six months. Finding employers willing to be involved is vital to the project. MOEP work with a variety of employers in the private and public sector, which change regularly depending on the season, for example, and what work is available. The NHS is one of these employers. Steve Lamming, estates supervisor with NHS Shetland, said taking on workers through MOEP had “worked out exceptionally well”. He said the situation was helpful to NHS Estates Shetland as budget restrictions meant that some maintenance work was being neglected, however taking on a MOEP participant meant the work could be done. The partnership went well and eventually the individual was taken on as a bank worker. Lamming said there had been some issues and it “hadn’t all been plain sailing”, but that any issues that arose were resolved with the “very reassuring” support he received from the MOEP team. The impact of helping people to find meaningful employment is difficult to quantify. Employment is important for life, on a very basic level to provide financial security, but it has a much wider impact, benefiting a person’s self esteem and mental health. Client feedback is overwhelmingly positive, with one person saying they “couldn’t praise MOEP enough”, and another saying they “still had to pinch” themselves at how happy they were with their job and increase in confidence and morale. You can get in touch with the Moving On Employment Project at Market House, Lerwick, by phoning (01595) 743926 and by emailing movingon@shetland.gov.uk.